The 2018 offseason programs across the NFL kicked off this past week with franchises getting their first field look at the players they drafted in the 2018 NFL Draft. With that came some impressive performances, some even enough to draw praise from their respective coaching staffs. While we took a look at some of those receiving praise on the offensive side of the ball earlier this week, here now are some of those who received praise on defense in one way or the other this past week, a few of which are PFF favorites from their respective times in college. Shaquem Griffin, coveted for his high energy and work ethic, stole the show at the Seahawks’ three-day rookie minicamp, as his non-stop motor even had head coach Pete Carroll, who is fiery in his own right, pleasantly surprised. Carroll joked that Griffin’s pace at practice forced his staff to “chill him out a bit” on Day 1 of minicamp and later followed up his comment with more positive remarks for his new weakside linebacker. At 6-foot, 227 pounds, Griffin was bound for a switch from edge defender to off-ball linebacker despite his limited experience at the position. 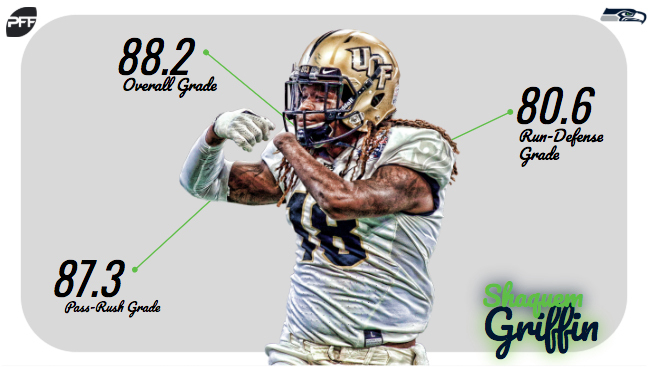 With UCF, Griffin played a majority of his defensive snaps as an edge defender, as he lined up along the line of scrimmage outside the tackles on 70.3 percent of his 1,715 defensive snaps over his final two collegiate seasons (2016-17). Conversely, he played off-ball linebacker just 7.1 percent of the time (121 total defensive snaps). Griffin’s early success in coverage also doesn’t come a surprise as he held his own playing 386 defensive snaps lined up over the slot or out wide over a wide receiver, collectively, from 2016 to 2017. He also allowed the lowest catch percentage (65.5) among draft-eligible edge defenders targeted at least 10 times in 2017. Taking a jack-of-all-trades approach to his Vikings debut, first-round cornerback Mike Hughes flashed his positional versatility early in rookie mini-camp. The former UCF standout took snaps at outside cornerback and slot cornerback on defense in addition to covering and returning punts on special teams in his first practice with Minnesota, per Eric Smith of the team’s official site. 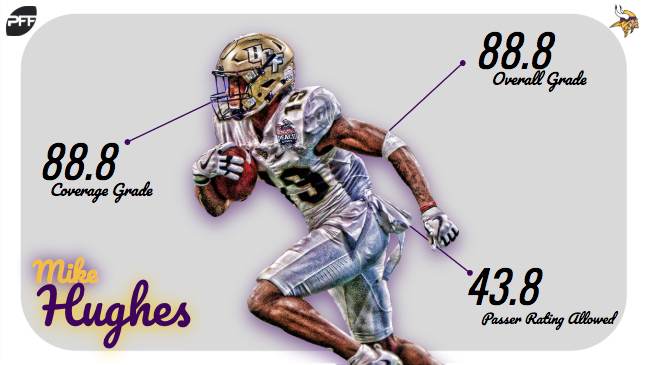 At 5-foot-10, 189 pounds, Hughes may be pegged as a slot cornerback because of his frame, however, he more than showed his own at outside cornerback at UCF. While playing 91.5 percent of his defensive snaps at outside cornerback in 2017, Hughes allowed a passer rating of just 43.8 when targeted, ranking ninth among draft-eligible cornerbacks with 470-plus defensive snaps. He also tied for eighth in yards allowed after the catch (67) and sixth in coverage grade (88.8) among cornerbacks with 40-plus targets in 2017. Taken back-to-back as the Packers’ first two selections of the 2018 NFL Draft, cornerbacks Jaire Alexander and Josh Jackson want to form a close relationship on and off the field to improve each other’s play and collectively strike fear in opposing offenses. And with first impressions in the books, such a formidable bond is seemingly well on its way. Green Bay’s new duo at cornerback has true star potential given their respective successes at the college ranks. 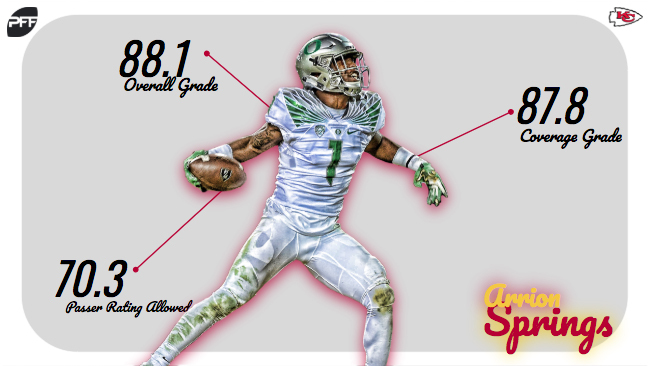 Jackson’s 96.8 overall grade in 2017 is the highest grade PFF has ever awarded to a cornerback in the PFF college era (2014-present). He also allowed just a 31.3 passer rating when targeted, ranking third in the class, and forced 26 incompletions (eight interceptions, 18 pass breakups). And like Jackson, Alexander’s numbers are off the charts. In addition to his 82.3 coverage grade in 2017, Alexander allowed just a 19.9 passer rating when targeted, which ranked first among cornerbacks with at least 237 defensive snaps played this past season. He also allowed the third-lowest catch percentage (28.6) among that same group of cornerbacks. Jets head coach Todd Bowles was quick to lay out high expectations for rookie interior defender Nathan Shepard at the team’s rookie minicamp, as he plans to push the former Fort Hays State star into the defensive line rotation to start the 2018 season, according to Andy Vasquez of NorthJersey.com. At 6-foot-4, 315 pounds, Shepherd possesses a rare combination of size, speed and athleticism, which allowed him to wreck his Division II competition and later make a name for himself at the 2018 NFL Scouting Combine. His reign of terror continued through the Senior Bowl, as he dominated in 1-on-1 pass-rush drills before suffering a hand injury three days into the practice week. Shepherd will face a bit of a steep learning curve trading Division II competition for NFL talent, but the early experience Bowles is set to offer him should have a positive impact on his development as he works to improve his technique and overall knowledge of the game. Signed as an undrafted free agent, former Oregon cornerback Arrion Springs is proving well worth the investment early on with the Chiefs. The 6-foot, 205-pound Texas native improved every year of his collegiate career with the Ducks, leading to a career year in 2017. He earned career highs in terms of both overall grade (88.1) and coverage grade (87.8), and he recorded 14 total pass breakups – four more than his previous two years combined. Springs’ early success in camp will pay dividends for him as he continues to push for a roster spot in Kansas City. If he can improve as a tackler and more effectively defend the big play, he has a shot to be a difference-maker for the Chiefs. Did either of these rookies find a spot in our top candidates for Defensive Rookie of the Year? Check it out now.